Do you have Cabin Fever? You know that insatiable urge to just chuck it all and get away from the hectic, chaotic stress of your everyday life? Have you always secretly longed for a cozy mountain cabin to retreat to when the pressures of your family and job get to be too much for you? Our Cabin Fever Suite might not be set in the Rocky Mountains, but it will certainly give you the illusion you are there. Every detail has been scrutinized so that you and your significant other can relax in your mountain cabin. The log beamed ceiling and walls and the majestic stone hearth fireplace will satisfy anyone yearning for their own cozy cabin. The hot tub is made just for two with reclining seats and so many jets you will feel as if you are getting a massage while watching the Plasma TV located for perfect viewing from the comfort of the tub. The hot tub has its own heater to adjust the water temperature to suit individual preferenes. The pine trees surrounding the tub, the corner waterfall and the scenic moutain view etched into the window separating the hot tub from the shower are further enhanced by the ever changing fiber optic lights in the hot tub. Check out the sauna and then take a cool relaxing shower in the huge shower. The shower is fully loaded with all the specials such as a steam shower, massaging showerhead and overhead showerheads that make you feel as if you are standing under a waterfall. All of the furniture was specially designed for our Cabin Fever Suite. The hand-crafted bed with its custom designed mattress will envelope you in such comfort you will never want to leave! The flat screen Plasma TV located above the fireplace can be viewed from the bed or the chairs, whichever you prefer. There's even a Plasma TV in the bathroom so you won't miss a moment of your program. What could be more romantic than sipping a glass of wine while cuddling on the soft fur rug in front of a crackling fire? Sip a cup of coffee in the mornng before you have to leave your Cabin to head back to civilization. The Sunset Inn and Suite's version of a cozy Mountain Cabin will make anyone want to move to the Rockies! 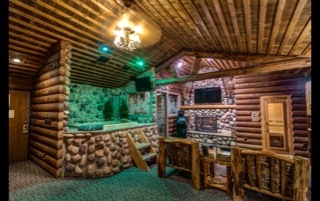 There are so many amenities in the Cabin Fever Suite; one night will not be enough! A DVD, CD player, coffeemaker, three Plasma TVs, refrigerator, microwave and wet bar are just a few of the amenities provided to enhance your enjoyment. Stay in our Cabin Fever Suite and get away from it all! You and your significant other will enjoy a break from civilization.